It's 2017, and the burrito has taken over the internet such that it's become one of humanity's most messed-with food items. There are monstrously huge, 2.2-pound burritos you can watch people eat. There is a burrito towel that lets you wrap yourself like a burrito. There are 3-foot-long burritos made to be eaten by the masses. There is even haiku poetry that can score you (real, normal-sized) burritos. 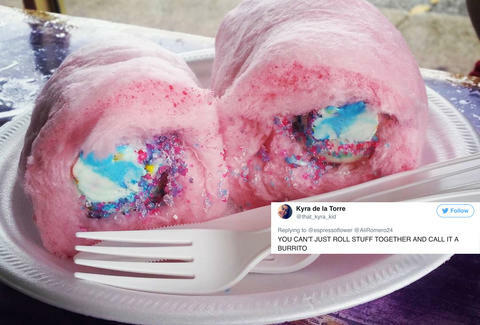 Then there are burritos that are not actually burritos, but called burritos, like the latest addition to the burrito lexicon: the ice cream and cotton candy burrito, made at Sugar Sugar ice cream shop in Sarnia, Ontario. Once more before we go on: Cotton. Candy. Ice Cream. Burrito. Just look at it. In another predictable 2017 wrinkle, this frighteningly compact diabetes-deliverer has also caused the hordes of Twitter to furiously comment on every aspect of its existence. The ice cream cotton candy burrito has driven an icy, creamy, milky wedge into the fabric of society itself. Let's assess the damage and check our blood sugar levels. It's going to be a bumpy, tooth-rotting ride. Of course this is in Sarnia. Nothing else to do there besides create ice cream cotton candy burrito. The cotton candy ice cream burrito was the last straw. No. It's an abomination. Burn it with fire. Is ice cream wrapped in cotton candy considered a burrito??? If a cannoli is a taco, then a hot dog is a sandwich and ice cream wrapped in cotton candy is a burrito. Can summer be over now?